First generation codling moth flight has subsided in both the mountains and piedmont locations. 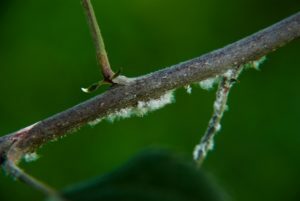 The only location where codling moth remains a threat, and where insecticidal control should continue, is where populations are historically high. This includes orchards adjacent to poorly managed orchards or where wooden apple bins (originating from other states) are stored. We are in the midst of second-generation OFM flight, but as mentioned last week, this generation is usually of little threat where the first generation was adequately controlled. Based on recent observations in commercial orchards, there is very little if any damage by first-generation codling moth or OFM. If an insecticide effective against TABM, such as Altacor (or Voliam Flexi), Delegate or Intrepid, has not been applied within the last two weeks, an application should be made within the next week. Finally, we’re approaching that time of the year when apple aphids and potato leafhopper populations are beginning to appear. Both insects prefer to feed on new shoot growth. Now is a good time to scout orchards to determine the need for control. They are easily controlled with a range of neonicotinoids or closely related compounds, such as Admire, Assail, Actara, Closer, or Sivanto.